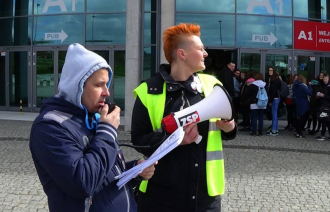 Following the national protest of postal workers in Warsaw on April 8, a national meeting was held the following week in Lodz to formalize the network and adopt a libertarian form of organization, based on our principles of direct democracy, leaderless unions and mandated and recallable delegates. 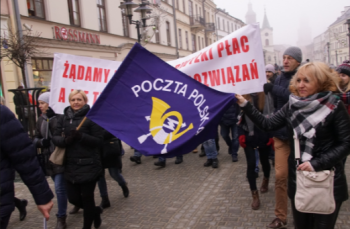 The meeting was the third national gathering, after the ones in Wroclaw and Warsaw which prepared the demands to the Post Office, the decentralized actions in March and the demonstration in April. The postal workers would like to push forward their postulates and continue organizing outside the mainstream unions which have continually sidetracked the workers to pact with the bosses. The Post Office does not want to talk about these postulates, relying on the bigger unions not to protest. Instead the PO has stepped up PR about how important it is to improve working conditions, but always claiming they „cannot afford it”. The workers know better and will not back down. Demands were also sent to the Ministry responsible for the Post Office as well as the government. They have sent them on for discussion but still have made no attempts to talk to the dissatisfied workers. 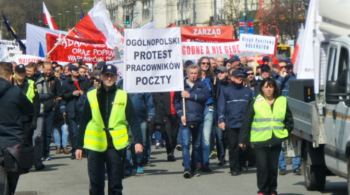 On April 8, 2017, a couple of thousand postal workers from all over Poland converged in Warsaw, demanding raises, reorganization of their work regions and the reinstatement of two fired colleagues. Workers have been coordinating outside of the mainstream, representative unions, which, in their opinion, do not represent their interests. A number of actions, including work stoppages of different kinds, have taken place across Poland in the past year. 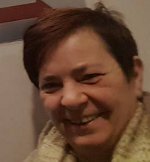 We have been coordinating workers at the national level and organized two meetings, in Wroclaw and then in Warsaw, where postal workers from all over the country took part. At the first meeting in Wroclaw, a couple of months ago, demands were formulated and later ratified by groups of workers from many cities. 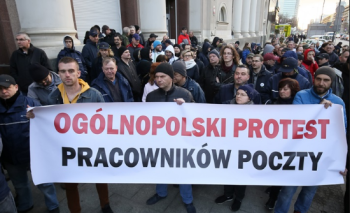 It was agreed that the demands would be sent to the post office, with a call for a response and that decentralized protests would be held all over Poland on March 16. Workers agreed that if there was no response to the demands, that things would only escalate. 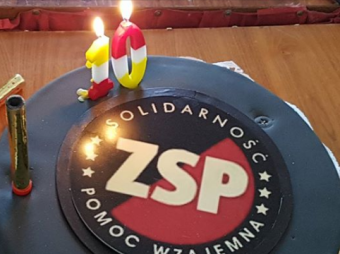 On April 1-2 the ZSP held its 11th Congress and 10th Anniversary event in Warsaw. The event took place on Sunday and consisted of presentations and films of different actions that ZSP organized over the years. These included not only many workplace conflicts and a few strikes, but also we presented some other types of activity such as anti-militarist actions and protests against price increases and for free public transport. This was interesting for some newer people who didn't know about a lot of these social actions. 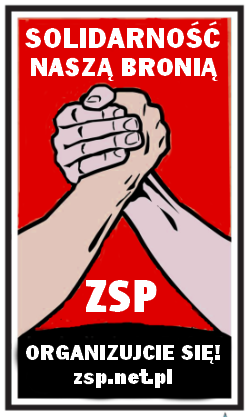 There was also a discussion about how ZSP is different than other unions and what the role of certain unions actually are today. This was important as in the hall were a few people who were betrayed by other unions and who could speak directly to that (as well as a few people from a couple of those other unions who maybe were interested in what we had to say). Finally, there was a presentation of some current conflicts, such as at the Post Office or Polomarket where the workers involved talked about their situations and struggles. One of the speakers was recently fired from the Post Office for his role in organizing protests and another is being repressed by Polomarket for speaking out about the working conditions. (The firm has brought a criminal case against him.) We spoke about the need for solidarity in these and other struggles.